2019 First Quarter Membership Meeting Saturday, February 16th! In an effort to streamline the membership renewal process, we are asking members to renew their membership at the beginning of each year. You have several options to renew. You can download a copy of the membership form off the website, you can click on the PayPal link on the home page, or you may ask your Local represenative on the Executive Board for a renewal form. The yearly fee is only $10. Please be advised that the Saturday January 19, 2019 General Membership Meeting has been cancelled due to a strong winter storm which is predicted to impact the Chicagoland area on Friday evening through Saturday afternoon. The meeting will be rescheduled for a later date. Details will be emailed and posted online. Let's get in gear for the New Year with fresh and new ideas and welcoming new members! Bring a new member to the February 16, 2019 First Quarter General Membership Meeting and be entered into a special raffle! The First Quarter Meeting will be held from 10 am until 12 noon at Local 731, 1000 Burr Ridge Parkway, Burr Ridge Illinois. Refreshments will be served. 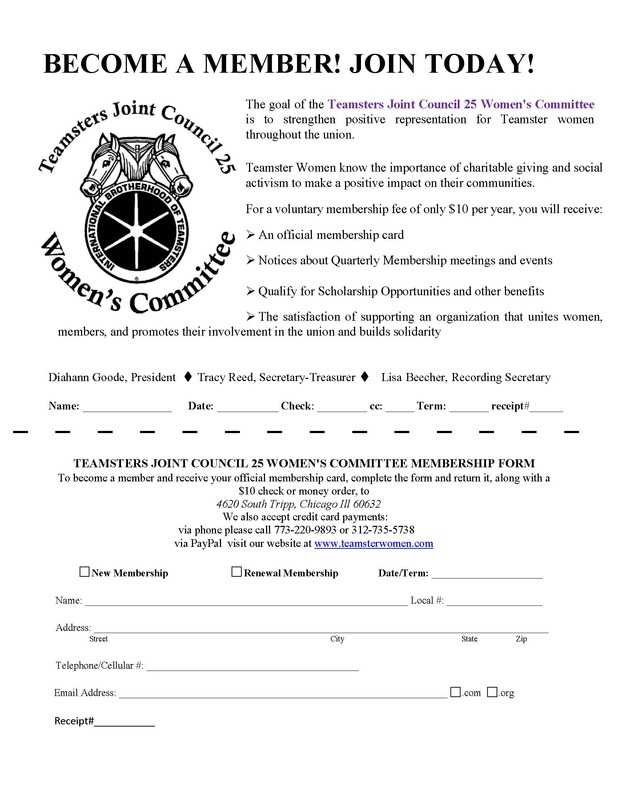 Apply for the 2019 JC25 Teamster Women's Committee Scholarship! APPLY NOW for 2019 Women's Committee Scholarships! The Teamsters Joint Council 25 Women's Committee scholarship program is aimed at assisting Teamsters who are continuing their education. The Women's Committee will award one $2,500-dollar first place scholarship and four $1,000 runner-up scholarships to members who demonstrate a desire to excel and reach their education goals. 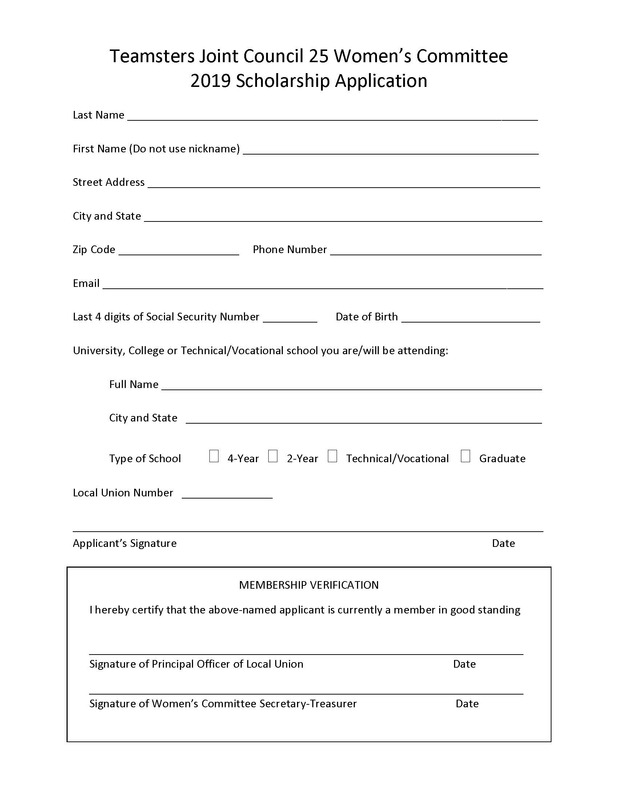 Completed applications and essays must be forwarded to the applicant's local union for verification of Teamster membership, and the local union will submit the paperwork to the Women's Committee. The deadline for applications is Feb. 15, 2019. 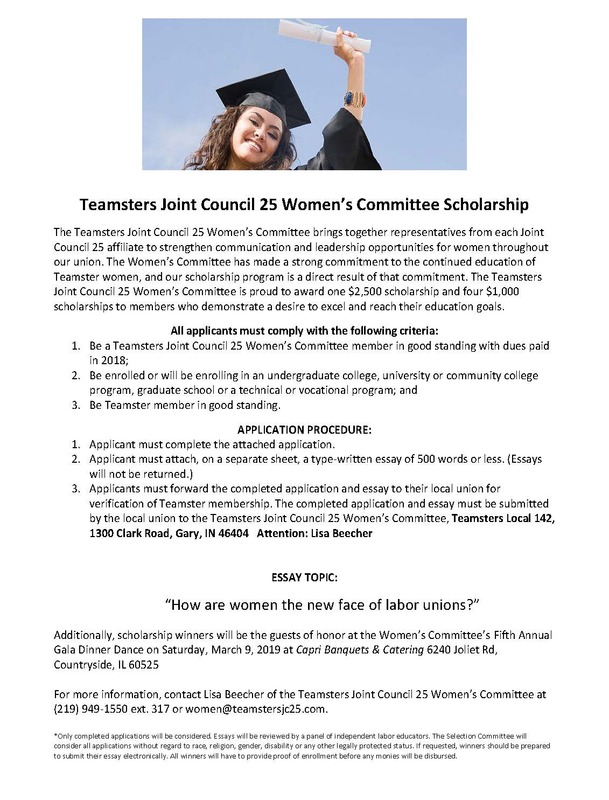 For more information, contact Lisa Beecher of the Teamsters Joint Council 25 Women's Committee at 219-670-4024 or email women@teamstersjc25.com.